The decision when to euthanize is as individual and as personal as you and your pet are. This is a judgment that only you can make, and it involves great personal courage and sacrifice. Many people fear they will not be able to recognize when the time is right. Do not hesitate to seek guidance from your veterinarian. It is good to include family members or friends who share a close bond with your pet in the decision-making process. This is a time when you will need the support of those who truly understand. Will the veterinarian who cared for your pet be the one performing the euthanasia? Remember, you have the option to change this, if necessary. The euthanasia procedure is typically done at the veterinarian’s office, but can also be performed at home. Your veterinarian may or may not offer this service, and if you prefer, he/she may be able to offer a referral. Euthanasia is normally a quick, peaceful, and should be a virtually pain-free procedure for your pet, regardless of where it is performed. First, a sedative may be administered, relaxing the pet. Then, an IV catheter may be established to get access to the vein. When the veterinarian is ready to begin the procedure an assistant will usually be asked to help hold your pet. Once the euthanasia solution is given, the animal’s muscles will relax and the heart will stop beating. It is a very fast-acting medicine. Most owners are surprised at how quickly death comes – in seconds. If possible, discuss with your veterinarian or his or her office staff before the appointment is made how euthanasia is performed at that particular office. Your pet’s health, temperament, and your preferences should each be considered when making this decision. For very small, young or old, or exotic animals, there may be some differences from the procedure just described. Be sure that you are comfortable with the procedure that you and your veterinarian choose. 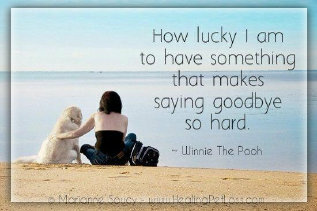 Before these final moments, you will have to consider how you would like to say goodbye. You may be present for the process, and decide to do this before your pet enters the room, or just prior to the procedure. Some feel they have to say goodbye in the room before then, and leave. As emotionally traumatic as it is, most pet owners feel they need to be present the entire time, hold their pet, and say their farewells during the euthanasia procedure. Most people spend private time with their pets before, as well as after. Most veterinarians will keep the body until a prearranged pickup service retrieves it for cremation. Generally, it is good to make all arrangements with the cremation or burial service long before that final day, so that the last moments with your pet are as non-stressful as possible. Also your decision-making abilities will be better, at that time. If it is possible, arrange for someone to be with you. There are several options for aftercare for your pet’s body. These are always influenced by financial and personal considerations, or religious beliefs. Most veterinarians will inform you of the choices, as they generally have a financial relationship with a nearby crematory. Cremation or burial are the most common preferences. Cremation: This option enables you to keep your pet’s ashes in an urn or other special container in your home, bury them — or even scatter them later, in a location that will be meaningful to you. And there is no time pressure on you to make any of these decisions. 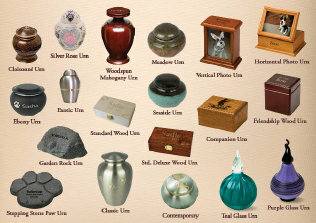 You can have your pet’s body cremated, either with other pets, or individually. In the less expensive group cremation there is no guarantee that the cremains that are returned (if requested) will be those of your pet. With individual cremation, the ashes are generally returned in an inexpensive box, to keep and deal with at your discretion. 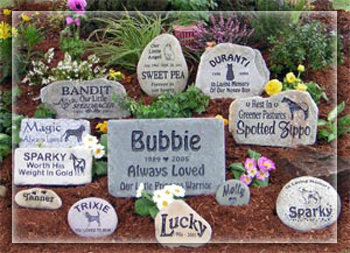 There are many pet cemeteries across the country. You can find them in the Yellow Pages, under Pet Mortuary Services. Most people don’t realize at first that the quality of management can vary quite a bit. Again, we suggest that you investigate this, beforehand, if possible. Prices vary, but expect a plot to cost at least $100 for a small pet — with additional regular maintenance charges. You can supply your own casket or buy one from a reputable retailer. Prices can vary from $50 for a no-frills plastic shell, up to over $500 for a more elaborate casket. Although they may have quality merchandise, be wary of the sales pitch often made at the cemetery or crematory. Immediately after the death of a beloved pet is not the time for you to make a good choice. Try to make these arrangements beforehand. 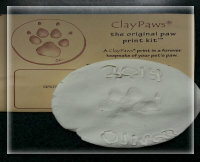 Clay prints make lasting keepsakes of pet's paws, hooves or claws. 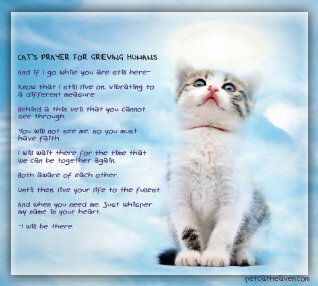 Losing a pet affects not only the people, but can also upset other pets in the home. 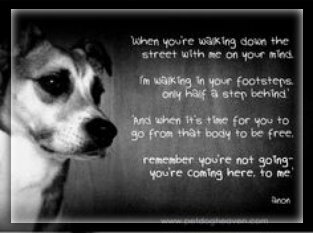 The makeup of your family has changed with the loss of your pet, and you may notice that your surviving ones may also experience grief. Sometimes you will observe crying, loss of appetite, looking for the missing pet, oversleeping, house-soiling mistakes, even disobedience. The adjustment to a new hierarchy within the home can also be a cause of change in behavior. If you feel the surviving animal is bereaving offer a special treat, a new toy — and most of all, extra attention from you. The grief should diminish over time, as does our own. It has been observed that the distress of pets is almost invariably made easier and briefer if they can observe and sniff the body of the deceased companion. 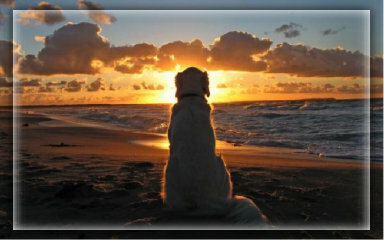 Many bereaving pet owners will find comfort in reading “All Pets Go To Heaven”. This information has been excerpted from the award-winning book, The Loss of a Pet, where there is a major chapter on the subject. The Loss of a Pet: A Guide to Coping with the Grieving Process When a Pet Dies (Fourth Edition). Wallace Sife, Ph.D.